Everton succumbed to a north London side for the second time this season. Beaten by Arsenal on the opening day of the campaign, high-flying Everton lost as Spurs scored a league goal for the first time in more than a month. The goal came early in the second half as Noe Pamarot looped a header over Nigel Martyn from a Robbie Keane cross. Soon after Pamarot made a superb defensive clearance when he got to the ball ahead of Kevin Kilbane after Leon Osman's shot richocheted off the post. Jacques Santini's side have been superb defensively this season and that solidity was again apparent as Spurs successfully protected their lead. A stop-start game also had some nastier moments, notably two ugly tackles from Jamie Redknapp and Jermain Defoe on Tim Cahill and Davd Weir. Cahill, who had been influential for Everton in the first-half, eventually had to be substituted. In tandem with Gravesen, Cahill had ensured Everton gained control of the midfield early on. In those opening exchanges Marcus Bent appealed for a penalty after he fell following an Erik Edman tackle. Soon afterwards Cahill, whose goal against Portsmouth secured third place for Everton last Sunday, popped up in the box to power a header against Paul Robinson's right-hand post. The Australian then picked out Osman in the box, but the Everton youngster's header was blocked by Robinson. 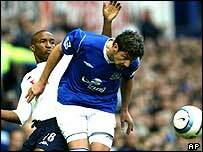 Having concentrated their attacks down the Spurs left flank, Everton probed on the opposite wing, allowing Kilbane to come into the game. The Irish winger cleverly chested Alan Stubbs' free-kick enabling Kilbane to slip away from Pamarot and flash a shot narrowly wide. Spurs' main attacking outlet in the first half was Defoe, whose ability to hold up the ball and run with it began to trouble Everton. Like Bent, Defoe claimed a penalty after he tumbled following Alessandro Pistone's challenge, though referee Graham Poll once again waved play on. Keane did force the ball home for Spurs, but the goal was ruled out for offside. Thimothee Atouba also glanced a header wide as the half drew to an end. In another ugly moment, the Cameroon international clashed with Tony Hibbert and Weir outside the tunnel as the players walked off for the interval. Having finished the first period strongly, Spurs went ahead on 53 minutes. Keane clipped the ball over from the right and Pamarot's header dipped over Martyn's despairing dive as the Frenchman claimed his first goal for Spurs. Pamarot, exemplifying the defensive resilience of Spurs, was soon back in his box foiling Kilbane after Osman's shot came back off the woodwork. The Frenchman maintained his defensive concentration to the very end, making three interceptions in the closing stages. Everton: Martyn, Hibbert, Weir, Stubbs, Pistone (McFadden 77), Osman, Carsley (Ferguson 58), Cahill (Watson 63), Gravesen, Kilbane, Bent. Subs Not Used: Wright, Yobo. Tottenham: Robinson, Pamarot, King, Naybet, Edman (Gardner 69), Davies, Redknapp, Pedro Mendes, Atouba, Keane, Defoe (Ziegler 80). Subs Not Used: Brown, Keller, Silva Sousa.